I seem to recall that even this card, expensive and awkward and reading like a card planted for Commander, has shown up in a fringe combo in competitive formats. As difficult as getting it into play might be, once you do, you’re not realistically going to lose unless you are actively trying: free Akromas and Elder Dragons, and free Glittering Wishes for even more, and free counterspells to protect them. Hypergenesis is a thing, and you never know – the likely Theros II: Get Jace to the Greek might have a Polymorph variant for enchantments. Omniscience is a big, flashy, stupid mythic rare whose text effectively says “win the game on the spot”. Which sounds about right. A full discount on every spell you cast is beyond broken, and it’s almost worth the price of admission. I say “almost”, because 10 mana in one of the weakest mana-acceleration colors is a very tall order. Of course, who cares about its casting cost when you can cheat it into play? 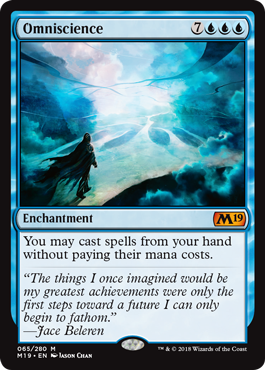 While Academy Rector and Show and Tell are the two flagship friends (the latter so much, it was responsible for the “Omni-Tell” deck in Legacy), there are a lot of ways to get Omniscience in without having to fork over all that mana. And it is more than worth it when you do get it on board. It’s unlikely that Omniscience does a lot in Standard without a way to cheat it in, but in formats where you have a lot more trickery, it can do a lot of work.